User friendly, 7-selection espresso & cappuccino machine. Popular beverage selection include espresso, cappuccino, café latte, black coffee, mochaccino, hot chocolate and French vanilla. Machines provide a great opportunity for office vending and/or mobile gourmet coffee business for weddings and other events. The countertop unit features: programmable adjustable beverage volumes and product settings, individual and total beverage counters, milk heated and frothed automatically, adjustable burr grinder with 34 settings, individual whipper chambers and dispensing tubes; no cross-contamination of beverages. Used coffee grounds automatically ejected. Dimensions: 27"X20"X16 Weight: 84 lbs. Bean hopper holds 3 lbs. Milk canister holds 2 lbs. Hot chocolate and French Vanilla canisters hold 3 lbs. Cup Holder stores 225 8oz. Various brand new spare parts included. Two matching floor cabinets available. Original Saeco 7P complete instruction and parts list manual included. Owner will give demonstration and verbal instructions on use and care of machines. The item "Saeco Automatic Espresso, Coffee & Cappuccino Machine" is in sale since Sunday, February 26, 2017. This item is in the category "Business & Industrial\Restaurant & Food Service\Bar & Beverage Equipment\Coffee, Cocoa & Tea Equipment\Espresso Machines". 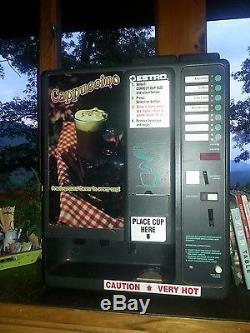 The seller is "rossogden2013" and is located in Otto, North Carolina. This item can't be shipped, the buyer must pick up the item.